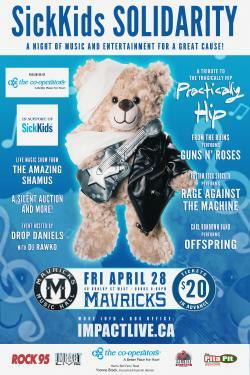 SickKids Solidarity - A Night Of Music & Entertainment For A Great Cause! BARRIE, ONTARIO, April 18th, 2017 – SickKids Solidarity (SKS) began in August of 2013 when founder Dan Stabb experienced every parent's worst nightmare - an emergency visit to SickKids Hospital with his then 10-day old daughter, Brodie. Albeit a short visit of only a week and a half, that time spent in the Neonatal Intensive Care Unit left a lasting impression. Solice was taken in providing Brodie a small mp3 player and speaker during her time in hospital filled with lullaby renditions of some favorite artists. In the spirit of the healing power of music, it was decided that every effort would be made to raise funds on a yearly basis by way of a benefit concert featuring the talents of numerous bands and friends. 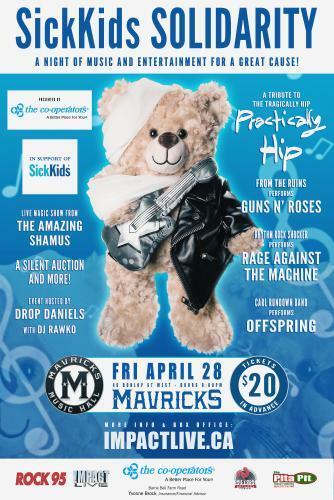 To date, SickKids Solidarity has raised upwards of $5000 for MARNIE’s STUDIO operated under the SickKids Foundation. With the help of corporate sponsors such as The Cooperators Group, Mavricks Music Hall, Impact Live and our entertainers; Practically Hip (performing The Tragically Hip), From The Ruins (performing Guns N' Roses), Rhythm Rock Shocker (performing Rage Against The Machine), Carl Rundown Band (performing Offspring), a live Magic Show from "The Amazing Shamus", plus a silent auction and event hosts “Drop Daniels with DJ Rawko”, we hope to make the 2017 installment of SickKids Solidarity the most successful yet! About SickKids: Our vision is simple: Healthier Children. A Better World. We believe fighting for the health and wellbeing of children is one of the most powerful ways to improve society. Right now, quantum advancements in scientific knowledge and technology – made possible by donors like you – present an unprecedented opportunity for SickKids. To be ready for the next round, we need to update our infrastructure so we can unleash the full potential of SickKids expert team. We need to expand our reach, to extend our excellent standards of care to more children around the world. We need to elevate our research - it’s our best weapon in the fight against disease and congenital childhood conditions enriching the compassionate care we believe fosters the lifelong wellbeing of children and their families. It’s a massive challenge, but one that must be met. So, we’re actively inspiring communities and individuals to take up the fight by investing in our Hospital, its mission, and the health and scientific advances your gifts make possible. We’re winning. Because every day we continue to fight! About Marnie’s Studio: Marnie's Studio is a newly renovated space (formerly "Bear Theatre") that creates an environment where patients and their families, including siblings and caregivers, can interact in a non-clinical, healing place filled with natural light and soft colours. The studio is designed to be open and flexible to accommodate patient and programming needs. Marnie's Studio has a mobile art bar and a large stage that offers expressive arts programming, a multimedia hub with new audio visual equipment to be used by patients and their families, and a multisensory room that provides a relaxing and calming environment for patients who may want to experience a stimulation that is different from hospital stimuli.